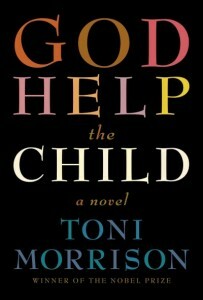 In case you want to read more about mothers hurting their daughters to protect them from worse horrors, but you’ve already finished Toni Morrison’s Beloved and you want something longer than Jamaica Kincaid’s “Girl,” you could pick up Morrison’s new God Help the Child. God Help the Child felt less powerful than Beloved (as do most books, honestly); the stakes are much lower. But I certainly appreciate that she wanted to revisit that idea. I finally cleaned out my childhood bedroom last week and found a portfolio of work from my high school English class. Apparently I’ve been writing about some of the same topics (free will!) for over half my life. It wasn’t the idea that a library might not want books that threw me. Our local library is fantastic, but at Stanford I spent close to an hour wandering around the buildings labeled “library” on the map wondering where the books were — most of the “libraries” were full of computers and multimedia stations and glass-walled whiteboard-lined meeting rooms. The thing that threw me when I read that line in God Help the Child was the thought, California prisons let them have old library books? Books HD by Abhi Sharma (Flickr). Which seems like such a small thing. They’re just books, right? But I’ve been volunteering a little with an organization that sends books to prisoners, and many prisons have onerous restrictions — can’t send hardcover books to this one, can’t send used books of any kind to that one, this other one you have to make an invoice of what you’d like to send, mail that invoice, wait a while for it to be approved, then send the books, with everything totally mummified by packing tape so there’s no risk of the books being rejected as water damaged upon arrival. The organization I volunteer with only serves prisoners in the Midwest, but I saw a link suggesting that California prisons have similar restrictions. Former library books are all used. They’re often hardcover. But apparently I was tricked. Because the restrictions I’ve been dealing with are for books sent directly to prisoners, and there are different rules for the collections owned & lent out by the prison itself. I asked a buddy who knows more about this than I do and he told me that California prisons usually have good libraries — he’s a big science fiction & fantasy buff and said he often had a lot to choose from. And if you don’t have a GED, they make you work toward it. So, good job, California. It’s totally evil that so many harmless people are locked up, especially the people given life in prison per the three-strikes law (here’s Matt Taibbi’s excellent article), but at least you’re helping some under-served people get an education. On charming sentences and sifting the OED.